Pillow Décor Ltd. announced today that it has partnered with Kukamuka, to produce a new line of Scandinavian-inspired throw pillows. 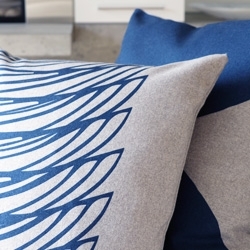 Designed by Vienna-based artist Paivi Vahala and Vancouver-based designer Petra Kaksonen, these unique graphic pillows are already catching the eye of interior decorators and retailers. Vancouver, Canada, January 16, 2019 --(PR.com)-- Pillow Decor Ltd. announced today that it has partnered with Kukamuka, to produce a new line of Scandinavian-inspired throw pillows. Collaborating remotely, Vienna-based artist Paivi Vahala and Vancouver-based designer Petra Kaksonen are the creative force behind design studio, Kukamuka. The Finnish-born design duo has combined their talents to create original print and surface patterns for architecture, home textiles, fashion, wallpaper and products such as tableware. Kukamuka has partnered with Pillow Decor to manufacture their first line of throw pillows. The pillows in the Luonto collection are available in three sizes, four colours, and include five designs (Lily, Kivi, Meri, Eka and Hay). The felt fabric feels luxurious and elegant, yet it’s perfect for everyday use – it’s unfussy and easy to care for. “We wanted to create a collection that feels modern but is also playful and fun; it’s an invitation to mix and match different colours and sizes to give a personal touch to any room,” comments Petra. Kukamuka is a collaborative project of two Finnish designers. Artist Paivi Vahala lives and works in Vienna and she has exhibited internationally in museums and galleries. Her work is included in various private and public collections. Designer Petra Kaksonen has worked as a graphic designer with Canada’s major publications in Vancouver for the past 18 years. Read more about Kukamuka on Kukamuka.com. Pillow Decor is a manufacturer, retailer and wholesaler of decorative throw pillows. Pillow Decor’s website, pillowdecor.com, offers consumers a large selection of quality throw pillows in a wide range of colors, styles and designs. Pillow Decor’s wholesale division supplies pillows to the retail, hospitality, promotional and special event markets. Pillow Decor’s head office is located at #101-196 West 3rd Avenue, Vancouver, BC V5Y1E9, Canada. Click here to view the list of recent Press Releases from Pillow Decor Ltd.